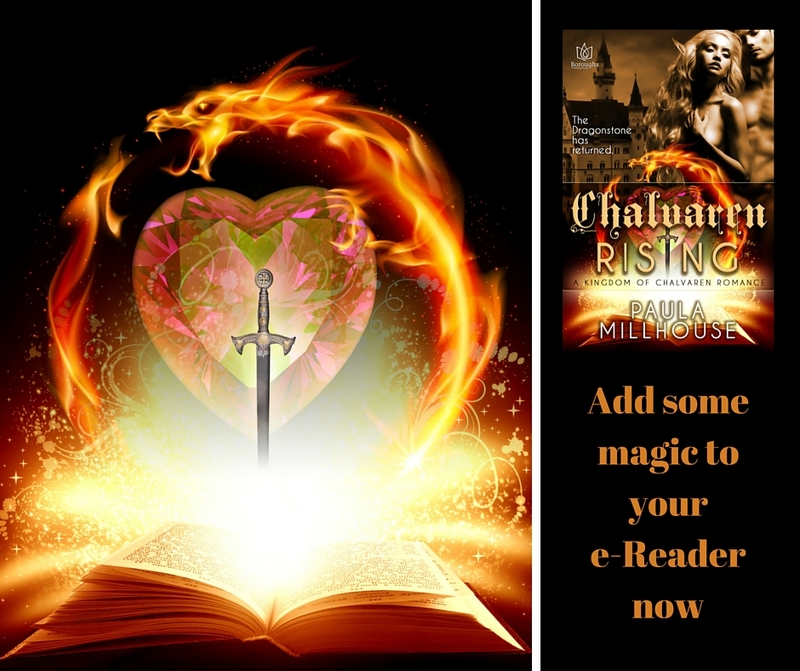 Fight Black Magic this Halloween – Read Chalvaren Rising: The Dragonstone has returned. Lucan and Queen Elissabet set to work in the interrogation chamber. Mia hovered at the periphery, watching them and ready to do whatever they asked. The first elf had been easy. He had been dying, and all Mia did was feel for him and be a conduit for the Dragonstone. Apparently her focus had helped Nerian join his soul with the artifact. The process had felt dignified and just, with Lucan administering last rites and Elissabet supporting all with the warmth of her aura. This other situation was a totally different level. Their captive hissed at them and fought against his shackles. He looked…bestial. Nearly naked except for a loincloth and boots, this elf’s flesh held a greenish-grey pallor. Was he dying too? Even though the chains secured him to the table, occasionally Mia thought she saw something squirming under his skin. The room reeked, and the closer she edged to the afflicted elf, the more she recognized the stench of death that rose from him. Mia cringed to see the way his muscles punched out from his flesh in wrong places, and his ears flapped out at an unnatural angle from a head sparsely decorated with long stringy strands of greasy hair. His cheeks resembled the jowls of a rat. “Arden Demar?” Lucan’s voice boomed with authority. The elf flinched and turned milky eyes toward the wizard. His wailing response was inarticulate and caused Mia to flinch. Lucan and Elissabet each placed hands on their captive’s sinewy green arms, and he screamed again. He struggled. Mia backed away and stumbled into someone. She reared around and found Kort, who looked pointedly at his mother. “Mia doesn’t need to be part of this,” he called, tugging on Mia’s arm. She snatched it away. “No, I’m staying.” Whatever the hell was going on here, she sure wasn’t leaving now, not if anyone thought she was the afflicted elf’s—the kingdom’s—only help. She took the Dragonstone in both hands and willed her aura into it. Whatever power resided there, she wanted all of it focused on whatever was happening. “We need her. This is as bad as we thought,” Lucan said. He cast Mia a glance before his worried gaze returned to the bizarre, misshapen elf. His inspection of the afflicted warrior intensified, and Mia grimaced. She saw Kort look uneasily back at his father, a hefty sword now gripped in King Lachlan’s hands. Arden became a writhing mass of flailing arms and legs. His pelvis bucked up from the table to the point his back nearly broke. Arden lunged forward then, at Mia, a howling sound tearing from his lips and showing pointed teeth as sharp as a dragon’s. The chains snapped taut but Mia raised her arm to deflect something that leapt out from the stinking red-black depths of Arden’s mouth. The flutter of its blue-black transparent wings assailed her skin with cold drafts of rancid air. A shadow? A demon? Was this the same type of wraith Magnus had shown her in the hall of thrones when they shared his vision of Chalvaren’s darkness? When he’d asked her to help them? Those shadows had borne the same winged creatures, the same stench of rot. She tightened her grip on the Dragonstone. The shadow screamed and turned on her. Mia broke free of Kort’s protective grasp, shouting, “Savla regina Elissabet, Varik. Save the queen!” The spell came from somewhere that she didn’t recognize, somewhere deep in her psyche, and it worked; her magic aura sprayed from her splayed fingertips and joined Elissabet’s in a sizzling hiss. Sparks flew and surrounded the demon. The wraith struggled to break free and reach them, black and feathery, but together Mia and Elissabet worked to subdue it. The creature howled in anger and malicious intent, but united the women were too strong, and the thrashing shadow creature finally disintegrated, its screams dissipating with its fractured particles of essence. Mia gave a tight nod. Behind them, Lucan was dealing with another specter that had burst free from the captive elf. It loomed twice as large as the last, but Mia leapt forward to engage. She thrust her palms in front of her, opening her hands, and the blast of her purple aura sent it sprawling. It rose a moment later, however, fluttering toward her. The Dragonstone warmed on her chest, bursting alight with ghostfire that she directed toward the specter. Elissabet’s magic joined hers, and the combined light energy seared the shadowy creature into oblivion. “More?” Mia yelled, hungry now for the fight. The queen had said there were more. She whipped around to see another shadow wraith leap from Arden’s body, this one three times bigger than the last. Lucan struggled to contain the demon within his silvery aura, but the damned thing filled the room with shrieks and stinking wings of ashy soot, blackening everything and threatening to suffocate everyone. Mia sucked in a tight breath as Lucan threw a bolt of silver magic at it, and Elissabet flooded the chamber with orange. The wraith knocked Elissabet to the ground. From her place on the floor, Elissabet screamed out words of a different spell. A horrible sound caught Mia’s attention, and her feet shuffled backward despite her resolve. The sound came from Elissabet, not another spell but a scream of anguish. At the same time the massive black wraith shifted and struck out at Kort and Lachlan, pinning them to the far wall. The two men clutched their throats, gasping for air as the shadow wraith forced them to their knees. “Mia,” Kort gasped, using the last of his breath. “Flee!” He collapsed, and the shadow wraith rose above him, intent upon something even more dire. “Oh, hell no!” Overcome by fury and desperation, Mia grasped the Dragonstone. Ghostfire poured forth, and Mia stalked forward toward the wraith, toward the man she loved and toward his father, both men collapsed before the umbral abomination. Arms wide, she directed the multicolored ghostfire onto the snapping, howling beast. It was all she could think to do. Behind her, Queen Elissabet lunged to her feet. Mia saw orange magic join her own, and she felt her skin warm with Kort’s mother’s gentle aura. It was the boost she needed, and she kept advancing. “Murmur cessant!” This from Lucan, whose angry words of defiance boomed behind Mia, supporting both women with flashes of mercurial silver that erupted from his fingertips to surround them, Kort and the king. It surged at her, its jagged, feathery wings reeking of purulent death. Crow-like, the shadow wraith screamed, its voice gravelly and deafening, but Mia kept it the target of her ghostfire. The wraith bent, let out one final agonized scream, and collapsed into a billion black molecules of oblivion. Behind them all, Arden Demar collapsed back onto his table with a clatter of chains. The ghostfire receded back into the Dragonstone with an affirmative snap, and Mia rushed to Kort. God, she’d never forgive herself if he was hurt. She reached for his head. Cradling it in her lap, she searched his body for injuries. Queen Elissabet rushed to kneel beside her, tending to Lachlan, slapping his cheeks, speaking to him, trying to rouse him and crying out his name. But Mia’s eyes were only for her prince. He groaned, and his eyes fluttered open. In that second Mia knew she’d never be able to live without him. She knew in that exact moment she loved Kort Elias, and that thought terrified her more than the wraith. Still, she leaned forward and brushed his lips with hers. Kort slowly embraced her. His lips found hers and took them with authority. She kissed him back with all the fierceness of a love nearly lost. “Are you okay?” His voice was a husky whisper, and he pulled her against him with arms that were surprisingly strong for all he’d seemingly been through. Mia nodded and hid her face in the hollow of his neck. They sat there together, shivering, holding each other. No one in the room spoke. “Is it over?” Mia asked finally, continuing to stroke Kort’s jaw. The queen kept one hand on her husband but held out the other to Mia, who reached back to take it. The two women clutched at each other in newfound solidarity, and the gratitude—and strength—the queen conveyed with her beautiful blue eyes moved Mia. This was definitely a woman she wanted to know better. Mia sighed, nodded, and closed her eyes.